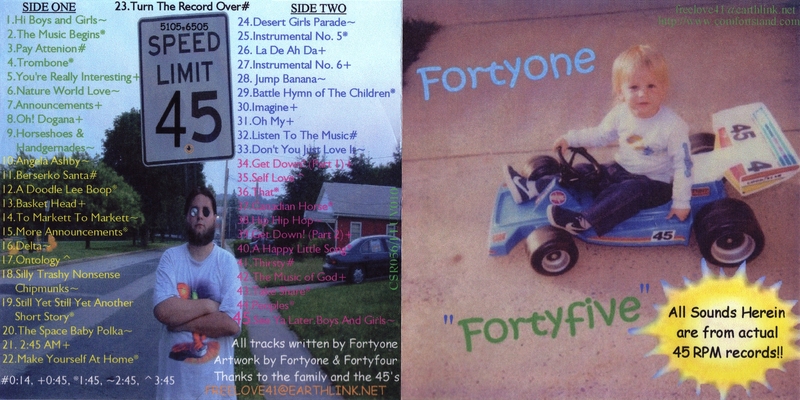 All tracks written by Fortyone. Artwork by Fortyone & Fortyfour. Thanks to the family and the 45s. "I wish to announce that... How did a vintage jazz/blues collector get involved with Fortyone? Well, a little more than a year ago, I was poking around on the Web, looking for unusual old sounds to download (I'm especially interested in material from the 78 RPM era). I stumbled upon the Comfort Stand site, and was delighted by Fortyone's Different Mayonnaise E.P.... his choice of sampled sounds made me laugh. I emailed him... and we've been swapping emails and CDs ever since. (Some material from my collection is sampled on Music That's Better Than It Sounds). For this album, his tenth effort, Fortyone has limited his choices to material that he has found on 45 RPM singles (remember those?). Of course, these samples are run through various processes and reassembled in ways the original artists could never have imagined. Where else could Neil Sedaka collide with the New Vaudeville Band, kiddie records connect with Lee Dorsey, and a Doodle-Lee-Boop wander around with abandon? Fiendish alchemy is at work here, folks..., here there be audio tygers that should tickle the funnybone of all but the surliest of grouches." (a wonderful site to listen to and explore pre-1930 jazz). 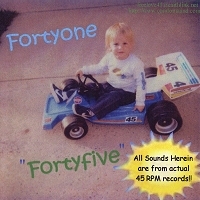 Visit 41music.net to enjoy ALL of Fortyone's music for FREE.